Fu CC, Burhouse JR, Chang GL. Overheight vehicle collisions with highway bridges. Journal Transportation Research Record. 1865/2004, 2007. Russo FM, Wipf T, Klaiber FW. Diagnostic load tests of a prestressed concrete bridge damaged by overheight vehicle impact, Journal of the Transportation Research Board, 2007, 1696/2000:103-110. 中华人民共和国交通部. JTG D60-2004. 公路桥涵设计通用规范. 北京：人民交通出版社，2004. Heavy goods vehicle collisions with bridges. Arup projects. 谢兰捷，郑振飞，卓卫东. 泉州后渚大桥防撞岛结构试验与分析研究.福州大学学报（自然科学版）. 2004, 32(3): 349-352. Minorsky VU, An analysis of ship collision with reference to protection of nuclear powered plants, J. Ship Res. 1959, 3: 1-4. Saul R, Svensson H. Means of reducing the consequences of ship collisions with bridge and offshore structures. IABSE Colloquium on Ship Collision with Bridge and Offshore Structures. Copenhagen, 1983. Derucher KN, Bridge pile damage upon vessel impact, Computers and Structures, 1984, 18(5): 931-935. Vrouwenvelder ACWM. Design for ship impact according to Eurocode 1, Part 2.7. Ship Collision Analysis. 1998:123-131. Schenker A, Anteby I, Nizri E, Ostraich B, Kivity Y, Sadot O, Haham O, Michaelis R, Gal E, Ben-Dor G.. Foam-protected reinforced concrete structures under impact: experimental and numerical studies. Journal of Structural Engineering, ASCE, 2005, 131(8): 1233-1242. Alexander JM. An approximate analysis of the collapse of thin cylindrical shell under axial loading. Quaterly Journal of Mechanics and Applied Mathematics, 1960, 13(1):10-15. 陆新征，张炎圣，何水涛，卢啸. 超高车辆撞击桥梁上部结构研究：损坏机理与撞击荷载, 工程力学, 2009, 26(sup.II): 115-125. 张炎圣, 陆新征, 叶列平, 何水涛, 超高车辆-桥梁上部结构碰撞荷载精细有限元模拟与简化计算, 工程力学, 2011, 28(1): 116-123. 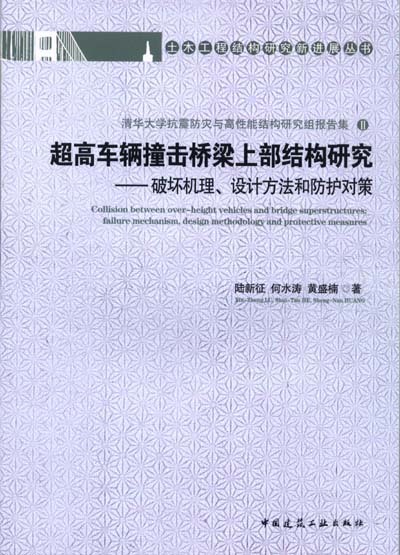 Zhang YS, Lu X, Lu XZ, He ST, Simplified model and design equations for the collision between over-high truck and bridge superstructures, Proc. 4th Int. Conf. on Protection of Structures against Hazards, Oct. 2009, Beijing, China: 425-432. 中华人民共和国建设部. 混凝土结构设计规范 GB 50010-2002. 北京：中国建筑工业出版社，2002. Holmquist TJ, Johnson GR, Cook WH. A computational constitutive model for concrete subjected to large strains, high strain rates, and high pressures. Proc. 14th International Symposium on Ballistics. 1995:591-600. Govindjee S, Kay GJ, Simo JC. Anisotropic modelling and numerical simulation of brittle damage in concrete. International Journal for Numerical Methods in Engineering. 38(21):3611-3633.